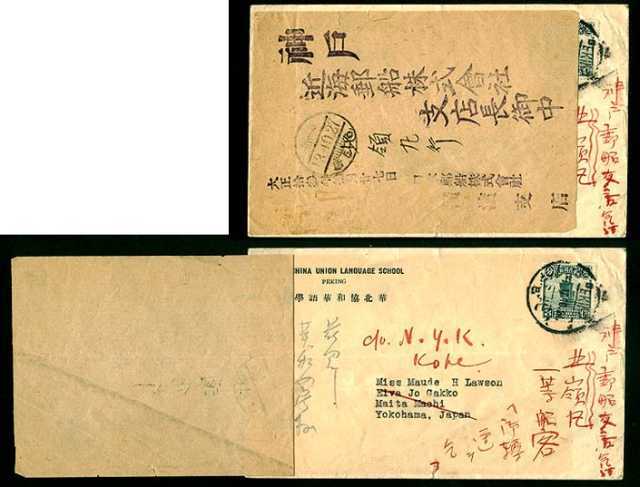 This cover was sent from Peking to Yokohama and forwarded to Kobe. The corner card is for the China Union Language School in Peking. In handling, the cover received many Chinese and Japanese markings that I can only speculate about. The cover was franked with a single 1923 3c blue green Junk (Scott 252). There is one English Peking CDS which appears to be October 13. The cover had a label glued on to aid in handling. and was arranged so that the cover read in the oriental style from top to bottom along the long edge. The label has a 13.10.27 CDS so the date the cover was sent was not October 13. Some Japanese instructions appear to be preprinted or stamped on the label. There also appears to be some additional information added by hand. somewhat reminiscent of the flaps added to carry stamps in Germany during the inflation era. When the cover arrived in Japan, the addressee was found to have proceeded elsewhere. The cover was forwarded to Kobe c/o. N. Y. K.
The abbreviation stands for Nippon Yusen Kaisha, a Japanese shipping line. N.Y.K. has a long history including delivering the famous cherry trees for Washington, D.C. tidal basin. They are now into auto deliveries (roll on roll off). Dave also suggests that the preprinted routing instructions to N.Y.K. have to do with the failed attempt to deliver the cover in Yokohama. which led to a rethinking of the explanation of this cover.